The imposing contralto known as ‘Augusta Roche’ spent a quarter of a century on the concert platform and, above all, the comic opera stage, on both sides of the Atlantic, but she remains known to more than ordinary fame for just one role, a role that she did not even create but, merely, introduced to the American stage. For America, Miss Roche quite simply was Gilbert and Sullivan’s Lady Jane (Patience). Augusta Darvell was born in London in 1849, the first daughter of a commercial traveller, Edward Stone Darvell, and his wife Augusta Mary née Keene, daughter of a vintner (m Marylebone, 29 September 1847). According to her obituaries, she had her musical training under Garcia at the Royal College of Music, according to a review or two it was the Royal Academy of Music, but since the programme for an 1866 (12 July) professional students’ concert at the more modest London Academy of Music features her name, singing ‘Quando a te lieta’, alongside those of such future notables as Fanny Holland, Jenny Pratt and Dove Dolby, I imagine that in fact it was there that she was educated. She seems to have started performing in public in 1868, when her name turns up as a replacement for Clara Lacey in the Bijou Operetta Co at Chatham (‘Miss Augusta Darvil’) ‘with the greatest possible success’, then in 1869 on the programmes of such lesser institutions as the Schubert Society, the Bow and Bromley Institute (alongside the young Edward Lloyd) and the Chatham Choral Society, as well as the concerts given by the pianist W Bollen Harrison, where she shared the bill with one Miss Pimina Hayes ‘chamber singer to the Princess Poniatowski’ and with a young baritone, by name Richard Temple. In 1871 Augusta was married to a surveyor, by name Roderick Edward Cherrill, and she seems to have taken time out thereafter, but in June 1873 she can be seen back, performing at the concert given by one Edwin Holland, singing ‘Nobil signor’ alongside Trelawney Cobham, Agnes Drummond and others of lesser fame, now no longer ‘Augusta Darvell’ but ‘Augusta Roche’. Between 1874 and 1877, she was seen on a variety of other, mostly lesser concert bills. When she performed with Edith Wynne for the British Orchestral Society, a critic dismissed her with ‘[her] qualifications are not yet obvious at a first hearing’, but the society must have disagreed for, in 1875, she sang at a series of concerts for them, including a performance of The May Queen, in one of which her colleagues was none less than Sims Reeves. She spent the summer of 1874 singing at Ramsgate (‘a charming voice and a decided vein for emulation’), visited Brighton for John Cheshire (‘Una voce’, ‘The green trees whispered’), appeared with the Albert Hall Amateur Orchestra and the Schubert Society, at the Brighton Aquarium and the Royal Aquarium, and shouldered with grander company when she appeared at St James’s Hall for the 1875 St Patrick’s Day concert (‘Dermot asthore’, ‘The Letter’ ensemble ‘She is far from the land’, ‘Savourn deelish’) alongside Santley, Lloyd, Antoinette Sterling and Edith Wynne. On 17 June 1875 she sang at Arthur Wilford’s concert, and when that gentleman launched his new Schubert Society of Brussels, Augusta was the featured vocalist at the inaugural concert (‘Nobil signor’, ‘Felicia marianis’, ‘L’ultimo pensiero’, Beethoven’s ‘Mélodies Ecossaises’), billed as ‘of the Covent Garden Promenade Concerts’. She appeared with the British Orchestral Society (Sullivan’s ‘Thou art not weary’), at the Alexandra Palace with Julius Benedict’s lectures, and in 1876 and 1877 at the Aquarium (‘C’est l’Espagne’, ‘Nobil signor’, ‘The Sailor Sighs’), at the Eyre Arms, Langham Hall, and in Birmingham and dates from Hastings to Middlesborough. At the end of 1877 (19 October), Mrs Cherrill gave birth to a daughter, Rose, and the following year, another, Lillian (3 October 1879), and – after the second child died -- appears once again to have taken time out, but on her return – her voice apparently now deepened since the days when she had trilled ‘Una voce poco fa’ and the ilk – she took the turning that would lead her to her hour of glory. She turned to the light operatic stage. Her stage career didn’t begin all that gloriously, for her first engagement was at the Alhambra, playing the little part of the Abbess, and understudying Fanny Edwards, in the successful London production of Offenbach’s La Fille du tambour-major. However, things soon got better. In October 1880 she was hired by Richard D’Oyly Carte to play the part of Ruth in The Pirates of Penzance, alongside Laura Clement, Gerard Coventry, George Marler and Walker Marnock, on the British road, and then, when Carte organised the company which would take his latest London success, Patience, to America (22 September 1881), he deployed Miss Roche, on a three year contract at $40 a week, to play Alice Barnett’s role of Lady Jane therein. As Lady Jane, Augusta Roche quite simply stole the show. The American critics went wild with delight. Miss Augusta Roche was a huge theatrical success and soon, on the heels of that success, she started being something of a significant social success as well. And that pair of successes brought with them discord. For Miss Roche decided that she was worth more than the $40 a week she’d signed for, and she demanded a raise. Surprisingly, Carte doubled her salary. But that was just the beginning. After Patience, she was moved to a revival of The Pirates of Penzance at the Bijou Theater where, once again, she was adjudged to be the show’s outstanding feature, then, at the end of that season, Carte summoned her back to England. But Miss Roche didn’t want to go back to England. She wanted to stay where her theatrical and social triumphs had been won. And she refused to go. Carte insisted. So she called in sick. Carte insisted, and Miss Roche took to writing anti-Carte missives to the newspapers. And she didn’t go. Instead, she went to Newark’s Park Theatre where she appeared as the star of the show in an amateur charity concert, giving of course her Lady Jane. The director of the Benefit had her a special costume made for the occasion ‘A dress of black satin with dead green Japanese silk draperies looped up and hooked on with large dead-gold bullion buckles and ornamented with sundry cords and tassels of the same material would of itself look pretty aesthetic. But upon the front breadth of the dress is embroidered in green and blue silk a life-sized peacock made of real peacock feathers...’. At the end of the concert she was interviewed: ‘Miss Roche lives with her husband and children in a fashionable quarter of the city and her apartments would form a capital illustration for the aesthetic apostle’s discourse on Household Decoration...’, an interview which she ended by once again stating her determination under no circumstances to return to England. And she didn’t. She stayed and she joined John McCaull to play Lady Jane in a revival of Patience. In November 1882, the newest Gilbert and Sullivan comic opera, Iolanthe, was brought to America, and for the Alice Barnett role of the Fairy Queen, Carte cast … Augusta Roche. So all was mended? Far from it. Miss Roche opened with the show, but before two months of the run had gone she was sacked. Helen Lenoir, the company manager, had had enough of her ‘star’s behaviour, and when she decided to, unilaterally, take a night off and go to another theatre, Mrs Lenoir moved. And sacked her. Miss Roche sued. And she lost. It was a bad year. For things weren’t going very well up at the fashionable apartment either. It seems that Augusta had been casting glances at a certain Dr Frederick W Jennings, and her husband, who had, for several years, been living comfortably off her earnings, was mighty wrath. His retort was to ‘kidnap’ daughter Rose, and to refuse to return her until Jennings was out of the picture. Augusta went to court and to the papers, Cherrill demanded $20,000 ‘alienation of affection’ money and sued for crim con. This time, Augusta won, and within a few months she had also won a divorce with custody of the child. Followed by a new husband. Back in the theatre, things would, soon, also go downhill. 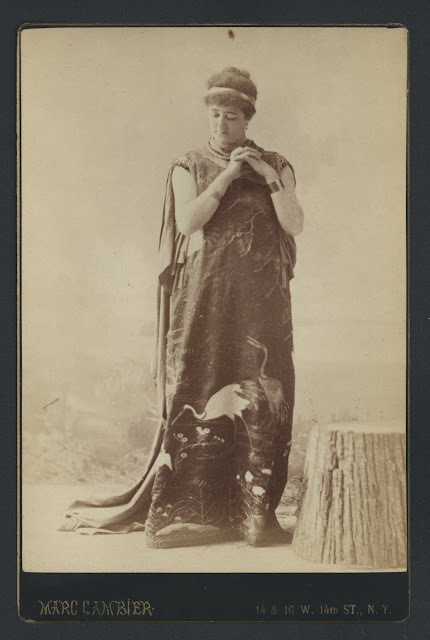 In 1883 she repeated her Lady Jane at the Standard Theatre (26 March) and then took the role of Public Opinion in Edward Rice’s rather peculiar version of Orpheus and Eurydice at the Bijou, but thereafter the winners became harder to find. She joined up with Barnett’s ‘New York Ideal Company’ ‘fifth season’, a third-rate outfit which wasn’t Ideal for long, and she toured with the unimpressive Thompson Opera Company, but light glimmered a little in 1885 when she was allowed back into the Carte fold to tour Canada and New England as Katisha in The Mikado. She appeared on Broadway as the Marquise in the American version of Serment d’amour known as The Bridal Trap (1886) for its four-week run, she took part in the not very classy out-of-town production of Richard Stahl’s original musical The Sea King (1890) and, in 1891, she appeared for what would be the last time on Broadway playing the role of Samarantha in the twelve-performance run of a minor musical entitled The Khedive mounted by the ludicrously named ‘Imperial Opera Company’. It was a far cry from Lady Jane days. In February 1893 she was reported as being ‘of the Deshon Opera Company’, another minor touring musical company, but for once there was also something positive to say. Miss Roche, the press announced ‘will retire from the stage in May and return to the UK, after 15 years on the US stage’. And this time she did want to go. For, so it was reported, Dr Jennings had ‘inherited $60,000 from his father’. She wanted to go. But fate wasn’t going to let her. Mrs Augusta Roche Jennings (properly, Mrs Mary Augusta Jennings) died, in New Orleans, in October 1893, at the age of 44.